Join one of the IFMGA-certified guides in the Peakshunter team on this 2-day climb to conquer the Mont Blanc via its easiest route, the Gouter Route. It’s my pleasure to invite you to join me on this 2-day adventure to the Mont Blanc summit via the Gouter Route. 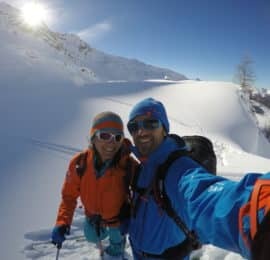 This trip is a perfect option for those with some mountaineering experience (including using crampons and ice axe) and a very good fitness level. Once at the top of Mont Blanc, the feeling of accomplishment is truly unique! This trip starts at Les Houches. Once there, we’ll take a cable car and a tramway to get to Nid d’Aigle. 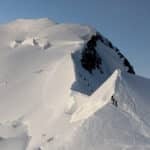 From there, we will climb up to the Tete Rousse Hut and finally arrive at the Goûter Hut (3817m) before dusk. We’ll have dinner and rest here for a couple of hours before the summit attack on the next day. In order to take advantage of the sunlight we’ll leave the hut at 3 AM. After that, we will face a glacial plateau until we get to the the Dôme du Goûter, at 4,250 meters of altitude. From there, we’ll keep ascending up to the Vallot Hut. At the end of the stunning Bosses Ridge, we’ll be finally at the summit of Mont Blanc. We’ll return down to Courmayeur after a long and intense climbing day. Although it is the least difficult way to reach the Mont Blanc, the Gouter Route requires a big physical effort so a very good fitness level is mandatory. Previous acclimatization is also very important in this 2-ascent, as well as having some mountaineering experience, such as walking in crampons and using ropes and ice axes. During the first day, the final 800 meters are quite demanding. In fact, there will be few sections with rockfall danger because of the melting snow. Regarding the second and most important day, you must be fit enough to walk on glacier and hike uphill for about 12 hours. If you are not sure whether your level and experience are enough to climb Mont Blanc, we will conduct a test on an easy glacier route. This half-day trip needs to be purchased separately. Please read the “Extra Information” section below to find out everything you need to know about hut booking and reservations. It will be an intense physical effort but the reward of reaching the top of Mont Blanc will make you forget everything. Once you reach the top, there will be no peaks obstructing the landscape between your eyes and the horizon. It is really exciting! For more details about next departures or booking process, please fill out the form and request to book this trip. It will be an honor for me to lead this expedition up to the highest peak in the Alps! 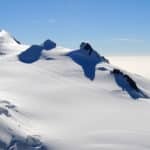 Starting in 2019, a maximum of 214 people will be allowed to climb Mont Blanc via its Normal Route on a daily basis, following a decision by the town of Saint Gervais. A new tax of 10-20 euros (amount to be defined in coming months) will be imposed and climbers wanting to make the ascent in more than 1 day will have to make hut reservations in advance (see Extra Info). Violators will be charged a 135 euro fine. 20 Euros/per person for ice axe, harness, crampons and helmet. Lifts ticket is around 40€/pax. Courmayeur, in the Aosta Valley or at les Houches directly. - Rules concerning the reservation and booking of huts are defined by the huts and can differ from one to the other. Peakshunter Mountain Guides can support clients with information and mailing lists but WE ARE NOT RESPONSIBLE FOR PAYMENTS OR BOOKING CONFIRMATIONS. Neither are we responsible for the introduction of new rules concerning limitations or special permissions to be obtained before the trip. Peakshunter Mountain Guides will provide the information on the booking modality and will not be responsible for hut rules and general laws concerning the access to Mont Blanc area and glacier. 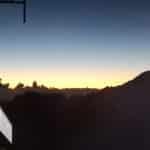 - Gouter Hut Reservations: Deposit for booking is 45€/person. Public booking dates for 2019 will be: Tuesday 16th April 2019 at 8.30am and Tuesday 14th May 2019 at 8.30am. Professional bookings can be made before the public dates but only online by Guides accounts: deposit for booking will not be refunded in case of trip cancellation. - Mont Blanc ascents cannot be managed as a last minute booking. Reservations must be made at least 4 weeks prior to the beginning of the trip. - Search and rescue insurance with IFMGA coverage (recommended): €5 per person for 3 days. - The mountain guide’s expenses (lifts, transfers, meals and accommodation) are not included in the price and must be covered by participants. The guide reserves the right to change any route or activity program based on conditions (weather, accessibility, refuge) and participants’ fitness level.